How to build a (bio-plausible) sparse dictionary (or ‘codebook’, or ‘filterbank’) for e.g. image classification without any fancy math and with just standard python scientific libraries? This simple example shows how to get Gabor-like filters  using just a simple image. In our example, we use a photograph of the astronaut Eileen Collins. Gabor filters are good approximations of the “Simple Cells”  receptive fields  found in the mammalian primary visual cortex (V1) (for details, see e.g. the Nobel-prize winning work of Hubel & Wiesel done in the 60s  ). 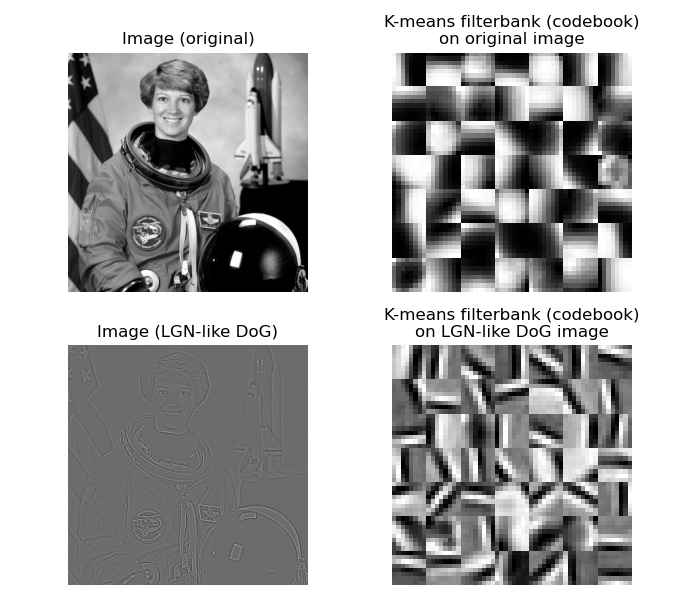 Here we use McQueen’s ‘kmeans’ algorithm , as a simple biologically plausible hebbian-like learning rule and we apply it (a) to patches of the original image (retinal projection), and (b) to patches of an LGN-like  image using a simple difference of gaussians (DoG) approximation. Enjoy ;-) And keep in mind that getting Gabors on natural image patches is not rocket science.